I was very happy to attend, together with my wife and my colleagues, the Prize-giving Ceremony for the 2016 Samoa Observer Tusitala Short Story Competition which was held in the Vaitele Office of Samoa Observer. We were very happy to meet our old and new friends and our colleagues from diplomatic corps. We were also very impressed by the poem-reciting by Dr. Selina Tusitala Marsh from New Zealand. The atmosphere was very enjoyable. Just a few days ago , Nov. 13 is the 166th anniversary of the birth of Robert Louis Stevenson, the much beloved Tusitala of Samoan people. RLS Museum is only steps away from my Embassy. That day, my wife and I paid a special visit to RLS Museum. As we saw the Teuila, the national flower of Samoa, on the gate of the Museum, as we walked on the Road of Loving Hearts, as we gazed at the top of Mount Vaea, recalling the beautiful verses of Requiem, we were deeply impressed by the love of Samoan people for Robert Louis Stevenson. Samoan people love Tusitala and love the stories written by Tusitala. It happens that there is a similar case in China. In 2012, Mr. Mo Yan, the famous Chinese writer who won the Nobel Prize for Literature, frankly stated in his Nobel Prize Reception Speech that he would rather call himself a storyteller. He said that he had grown up listening to all kinds of interesting stories from his grandmother and his mother, and later he himself also became a storyteller and made storytelling his lifetime career and finally he won the top prize in the world for literature. In fact, wherever we are, we all like listening to stories, stories happening around us, stories in the past, stories full of imagination. 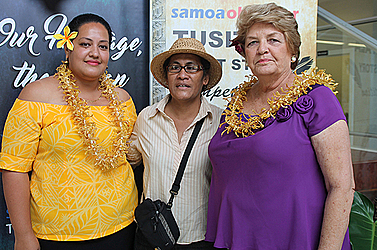 Samoa Observer, as the most influential newspaper in both English and Samoan languages, is very popular among people. The reason for its popularity is that it tells stories of all kinds everyday, stories from villages, from neighboring countries, from China, from all over the world. People get to know more and more about the world they live in and about the outside world. In 2011, Samoa Observer organized a writing competition for students all over the country, and later in 2015, organized the Samoa Observer Tusitala Short Story Competition. These competitions encouraged people of all ages to write and share their stories with other people. And now, we are glad to know that more excellent works are produced by talented storytellers this year and we look forward to reading their wonderful stories. As Chinese Ambassador, during my past one-year stay in Samoa, I feel like that I have also become a storyteller. I have told many amazing stories of China-Samoa friendship to both Samoan friends and Chinese friends. In fact, I am the person to continue telling these kind of stories following my many predecessors since 41 years ago. Actually the connection between China and Samoa started more than 100 years ago and if we put all these stories into one book, it will be a huge huge book, indeed. Before I conclude, I want to tell you a one-sentence story: Two Chinese astronauts have just come back to the Earth from Space on 18 Nov, 2016. I am sure they also have extraordinary stories to tell about their life in the Space in the past 30 days. Thank you!